It's time for the next Cooking Club Recipe! I love calzones-so when I see the word easy and calzones in the same sentence, well sounds good to me. This is the recipe that Melidee submitted this month. It comes from America's Test Kitchen. And our lovely picture is once again from the talented Miss Rachel. You can see more pictures of this recipe on her photo blog here. Just be warned, she changed her 365 blog into a food picture blog this year. So only go look at her pictures if you are ready to drool and if you are prepared to get really hungry! 1. Adjust oven rack to middle position and heat oven to 450 degrees. Pat broccoli dry then toss with the mozzarella, chicken and pesto. Season with salt and pepper to taste. 2 On a lightly floured counter, roll out half the dough to a 12-inch round, about 1/4 inch thick. Mound half the filling onto one side of the dough, leaving a one inch border. Brush the edges of the dough with water. Fold the other half of the dough over the filling and press the edges to seal. Repeat with the remaining dough and filling. 3. Transfer the calzones to an oiled baking sheet. 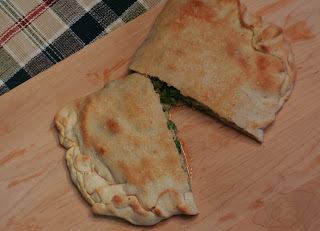 Use a sharp knife or kitchen shears to cut 5 slits diagonally across the top of each calzone. Brush the oil over the tops and sprinkle with coarse salt if using. Bake until golden, about 15 minutes. OMGYUM! I'm adding this to my recipe file now. Thanks for sharing! haha, you're so sweet! Thanks for the compliments. I really loved these. Yum!! That looks yummy! I am off to check out her site........as soon as I eat something. You know, how you aren't supposed to shop hungry? That sounds so good! I LOVE calzone. Puffy heart love. Calzone? George Castanza probably has nothing on this one. Sounds so much better then the ones I order in! Calzones! Oh my word, I haven't had one in forev... But this! This with chicken? Girl, I gotta steal this recipe and satisfy my cravings. Thanks for sharing!